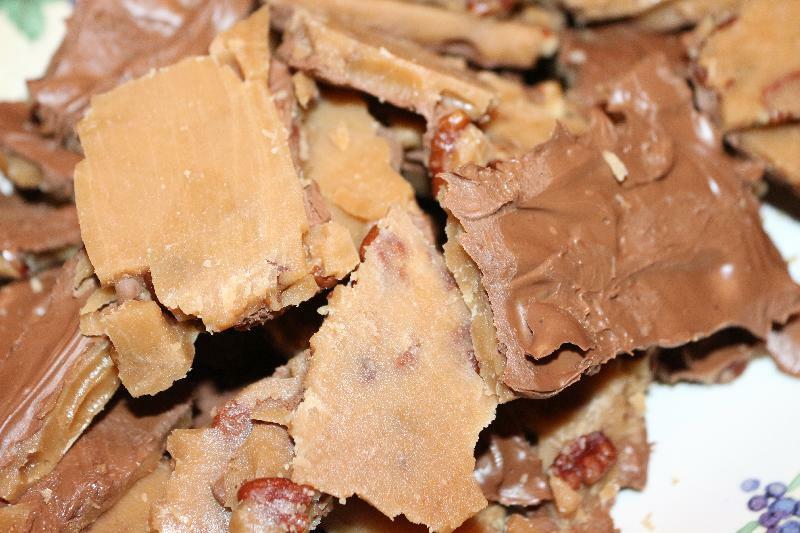 I had never tried toffee until I hosted a Mrs.Prindable's House Party in December of 2012! Needless to say I loved it. Today I happened to see a recipe for it on Food Network. I couldn't believe how easy the directions were and that I had all the ingredients on hand. I found this very yummy. Though next time I will probably add more pecans. I plan to add this to my baking at Christmas time that I give to friends. 2. Put the butter, sugar, and water into a heavy pan over medium high heat. 3. Bring to a bubbling boil, stirring constantly with a wooden spoon, about 10 minutes. 4. Remove spoon from the pan and cook to a very brittle stage (300 degrees to 310 degrees F on a candy thermometer.) Or, make a cold water test: drop some into a bowl filled with cold water. It should turn hard and into brittle threads. 5. Remove from the heat and add nuts to the mixture. Add the vanilla and salt. 6. Pour onto the prepared cookie sheet and spread to 1/4-inch thickness. 7. Cool slightly and top with the chocolate chips. Spread the chips as they melt. 8. Cool completely and break into pieces. Store in an airtight container. Description: A treat to satisfy your sweet tooth!